I know we’re already halfway through January now, but I wanted to officially wish you all a happy 2015 here on the blog! January is always a refreshing time of year. You begin to settle back into ordinary life after the hustle and bustle of the holidays. It’s also a time for reflection and setting goals for the upcoming year. Each year I set a goal for myself in three areas of my life – health, personal, and career. It’s been really fun to track my growth over the years. I remember one year my goal was to learn how to cook. And now I love cooking! This year is full of many new goals for me as a new parent. I am breastfeeding Baby Awesome, so I want to make sure my diet is nice and healthy so I can give her the best nutrients possible. And I also want to work hard to get back to my pre-pregnancy weight and begin working out again once I am cleared by my doctor. I chose this photo because it was taken right before I got pregnant with Baby Awesome. 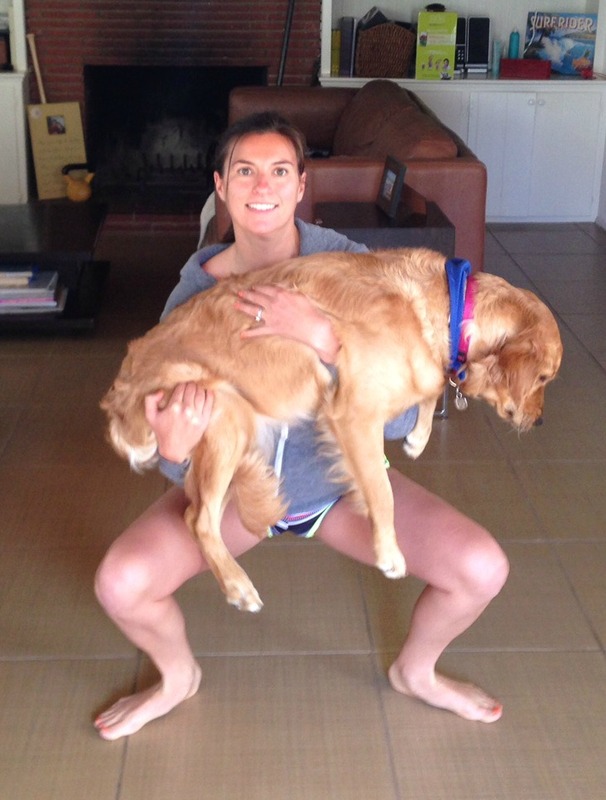 I was in great shape and used to have fun picking up Kona and doing puppy squats (I probably enjoyed more than she did, LOL) . She weigh 55 lbs so being able to get back to the point where I can pick her up and do puppy squats would be great. Every month there is a prize on the We Dare You site valued at $400. In addition to this, you have the opportunity to win an additional prize by entering through Fit & Awesome. 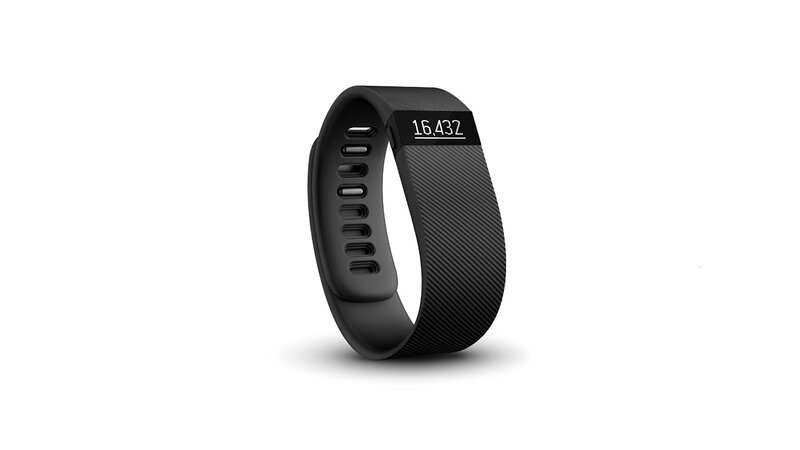 This month we’ve decided to give away a Fitbit Charge! Why? Because we think having a fitness tracker is a great way to keep you accountable and reach your fitness goals in 2015. Not only that, but the Charge is a new device that I haven’t even been able to try out yet so we think it’d be fun to give this away to one lucky winner. You can enter multiple times per day so be sure to get on it. Good luck! What about you? What are your healthy resolutions for 2015? Post in the comments and let us know! YES!!!!!!!!!! Want. I’ll be drinking more water this year. And walking more! Come walk with me, Kona, and Baby Awesome! I am going to continue running along with motivating my boys to be fit. I also want to eat fewer processed foods, fuel my body the best I can to increase my performance in upcoming events. I’m turning 40 this year but am still in continuous search of PR’s every time I toe a line. Those are great resolutions. What races are you doing this year? I can’t wait to get back into race shape. We are doing the Toledo Marathon Relay as a family and I am running the Pittsburgh Marathon a week later. I finally got into the New York City Marathon after trying for 3 years! I have some half marathons this year also and will probably try to add a couple more marathons. I curb my diet a couple of months before a big race, basically not consuming refined sugars. The first couple of weeks I get a big grumpy but then my body stops the cravings. I want to get back to running shape and to GET BACK TO THE GYM to lift!! Let’s do a race together! Gym, tan, laundry, babies! I miss doing yoga! Can’t wait to get back into it. Do you go to a studio or practice at home? I have been drinking more water and exercising daily with my adult sized weighted hula hoop! Nice! Do you have a specific hula hoop workout you follow? I’ve always been interested in trying that! Always a good goal. Good luck to you, Christina! I am going to be strong & healthy so I can keep up with my three kids this year! That sounds like a good plan, MJ! Kids are tiring! I want to be a healthier role model for my three boys. Drinking more water, cutting out soda. Being active with my boys and teaching them healthier food choices. So true, Natalie. Our children learn from us so we have to be positive examples! I’m on day 18 of my first Whole30 to kick off the new year right! Not too different from my normal diet, but I wanted to cut out artificial sweeteners and the nightly glass of wine lol. One of my resolutions for this year is to go back to practicing yoga more regularly. I’m pretty active, but not enough stretching. Thanks for the awesome giveaway! Congrats on the Whole 30, Jordan! Have you checked out the Whole 30 section of my site? I’ve done it twice now and LOVE it. I always feel better when I practice yoga regularly, too. Going to try and make it more of a habit this year once I get cleared to exercise again. To run a marathon, I’ve been training slowly for one, but I will do it! That’s a great goal, Harolde! Which marathon are you training for? to lose the baby weight from baby #3 and #4 after #4 is born this year! Congratulations, Anna! When is baby #4 due? My healthy resolution for the New Year in 2015 is to challenge myself more. Eat more fruit and vegetables and walk more instead of driving! My resolution is to get running more and drink more water. Cutting back on sweetened drinks and drinking more water. My healthy resolution is to start walking to work. It is only 2 miles each way and I have done it before but I need to start doing it all the time. My resolution is to walk 10,000 steps nearly every day. I always wear a pedometer. This one looks cool.